Revenge are one of the few remaining truly scary black metal bands. Their sound is wholly bestial and demented, weird over the top and almost terrifying at time.s The breadth of their sound and the sheer demonic majesty of some of these tracks is going to leave you in awe and, though this may just be an EP from the living legends, it is the kind of wonderfully evil music that can't help but to fascinate and leaving you gasping for your next breath as you drown in a sea of oppressive animalistic volume. 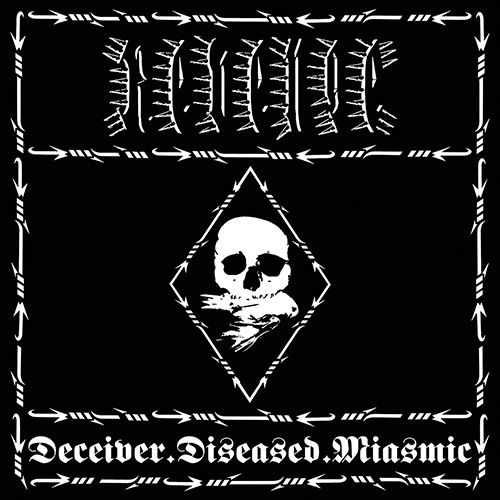 The way that the band blazes forward on Deceiver.Diseased.Miasmic is indicative of a group who have ground it out unforgivingly and unapologetically for two decades now. 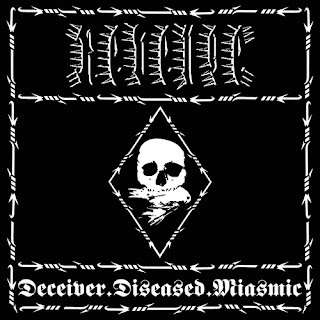 The swagger that they bring to the table with tracks like Deceiver Futile is palpable, but it's all part of the mystique. The chainsaw buzzing of the guitars provides a twisted backdrop for the tormented growls to wind their way out of frontman James Read. He has a sort of nihilistic approach that speaks to an almost Lovecraftian torment within him and a snese of inherent darkness that he will never truly shake but instead be forced to suffer with forever. One day I hope to iunderstand the true misert of this record, the true desperation and screeching pain. This is not an album to be taken lightly nor is it one that you can just put on casually. Deceiver.Diseased.Miasmic may only be two songs but in under ten minutes Revenge say more than most of their peers have managed to communicate with their entire discographies. This dedication is freakish and admirable, speaking to a group who have never shied away from true hatred and whose bitterness will only grow with time.